One can never quite understand how difficult it is to be a Mom until one becomes a parent. So here’s to all the super moms out there and all the kids who wish to wish the superwoman of their lives a happy mothers day. 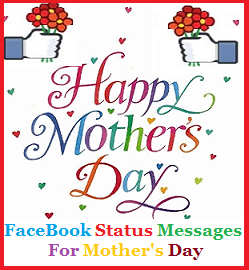 Celebrate “Mother’s Day” by using some of these best facebook status messages for mother’s day collection. Pamper your mom and make her feel special by posting these messages on her facebook wall or simply send her happy mothers day message by card or SMS. Mom spelt upside down is Wow. Says it all. Happy Wow Mother’s Day. For me, every day is Mother’s Day. Here’s to all the super women. To the underpaid, overworked and often unappreciated coworker – I realized how tough it is to be a Mom when I myself became one. Happy Mother’s Day. They say that God can’t be everywhere and that’s why He created Moms. So true. Happy Mother’s Day Mom. Proud to be a Mamma’s boy. Happy Mother’s Day. You can fool some people some times; you can fool most people most times; but you can never fool Mom. Happy Mother’s Day! Maa, Mummy, Mamma, Mother, Mom, Mommy – Whatever you might call her, she is one great bundle of love. Happy Mother’s Day. When was the last time you kissed or hugged your Mom? Today’s your chance to make her feel special. Happy Mother’s Day. There’s only one perfect child in the world. And every mother has it. Doesn’t this say a lot about our Mothers? Happy Mother’s Day to all of you. This Mother’s Day, make her feel special. Don’t buy her any gifts. Don’t take her out shopping. Simply spend some time with her. Your Mother is just a hug apart. What is taking you so long to reach out to her? Happy Mother’s Day. “To love someone is to see him as God intended him” – Dostoevsky. Do we actually see our Moms as God intended her or do we take her for granted? Think, this Mother’s Day. Someone said that as a mother you tend to think twice – once for yourself and once for your child. So true. Here’s wishing all my fellow mothers who don’t think twice before making any sacrifice a very happy Mother’s Day. Mummy taught me this cute nursery rhyme – If you’re happy and you know it and you really want to show it – I would like to complete it by saying – hug your Mother. So all you happy people, spread good cheer this Mother’s Day and give Moms a big hug. Hey Supergirl, Happy Mother’s Day. Just one day to tag you – not fair. This Mother’s Day, don’t just post on FaceBook how awesome your Mom is. Go up to your Mom and tell her so as well. Happy Mother’s Day to my mother and best friend. Mothers hold their children’s hands for a short while but their hearts forever. To all the loving Mothers out there – Happy Mother’s Day. Even if a child does not say it, a mother understands it. I know that to be true with my heartbreaks and misses and failures. Love you Mom. Happy Mother’s Day. This Mother’s Day, I really want to ask Mamma where she keeps all that love and care? Love you Mamma. I know I never said it but now I really want to tell you Mom that you are the best guy in the whole world. Happy Mother’s Day. Whenever I get hurt, I say “Mummy”. Whenever I get scared I say “Mummy”. Whenever I feel sad I say “Mummy”. I wonder why I never said “I love you Mummy”. Happy Mother’s Day. I fought so much with you as a teenager. I rebelled against you. I did the exact opposite of what you told me to do. But all this while, you stood by me and for that I simply love you. Happy Mother’s Day. I wish I could have listened to you Mom. I realize that now. But you let me make and learn from my own mistakes. I wish I can be as good a Mom as you are. Happy Mother’s Day. Thank you for always being there for me. And that’s quite a lot of times. Love you Mom. Happy Mother’s Day. And thank you for letting me tag you in this post. Happy mother’s day mom! It’s a perfect day to say how much I love you. Thank you for being a kind and loving mom. Thank you for being always there for me. You are my best-friend. Every day I pray to God that He bless you with good health and long life so that you will always be with me. Mom, I love you more than you ever know. I feel so blessed because you are my mother. Happy Mother’s Day! Happy mother’s day to best mom in the world. I’m so proud of you mom. You never leave me and you always support me. Thank you so much my dear mom. I love you. You are so great mom. Happy Mother’s Day! May the good Lord bless you more. Hello to the “supermom” of my life. On this day, the world is celebrating with you and I want to greet you a “happy happy mother’s day!”. Thank you for all you’ve done for me mom. I love you. Happy mother’s day mommy! Ever since I was a child, I have known your hard work for me and to my siblings. Your love and effort is something remarkable and unconditional. Thank you mom for the love. We also love you! Happy mother’s day! 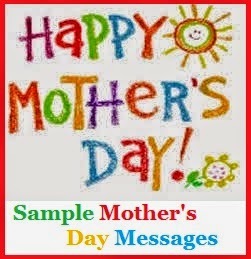 Today, let me greet you a “happy mother’s day!”. You deserve a break mom, let’s have a dinner date tonight and celebrate love, happiness and joy. I love you. Happy mother’s day! Happy mother’s day! You are the best mom in the world. Mom, I want you to know that you are incredibly beautiful inside and out. 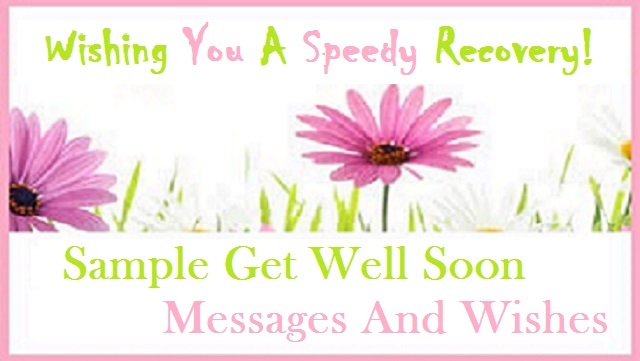 Thank you for the love, care and support you are showing to us each day. I love you and happy mother’s day! You are always there for me, you we’re like an angel who watches me every day. You know what’s inside my heart even when I don’t speak. You are amazing mom. I love you. Happy mother’s day! Today, the world is celebrating the importance of every mother. And to my mom, I celebrate with you with all my heart and love. Happy mother’s day mom, I think I will never be what I am right now, not without your love and support. I love you. To the awesome mother in the planet, happy mother’s day! You know when I’m happy and you’re always there when I’m sad. I’m so thankful because you are my mother. God bless mom and let’s celebrate tonight, happy mother’s day! Thank you for being my light to brighten up my day. Thank you for giving me hope in times of problem. I know being a mom is not easy but you never fail to be the best one. Happy mother’s day! Happy mother’s day mom! I promise to be a good daughter/son and I will try my best to always make you smile. I love you!